Habit: Perennial herb, generally minutely strigose and long-spreading-hairy, or +- glabrous; caudex woody, branched below ground. Stem: 10--120 cm. Leaf: 10--70 mm, linear to narrow-elliptic, entire to coarsely wavy-serrate. Inflorescence: bracts 2--5 mm. Flower: hypanthium 4--13 mm; sepals 5--10 mm; petals 3--8 mm. Fruit: erect or spreading, 4--9 mm, 4-angled; stalk-like base short, thick, > 1/2 diam of widest part. Seed: 1.5--3 mm. Chromosomes: 2n=14,42,56. Synonyms: Gaura coccinea Pursh; Gaura coccinea var. glabra (Lehm.) Munz; Gaura coccinea var. glabra (Lehm.) Torr. & A. Gray ex Munz; Gaura suffrutescens Ser. Citation for this treatment: Warren L. Wagner 2017, Oenothera suffrutescens, in Jepson Flora Project (eds.) 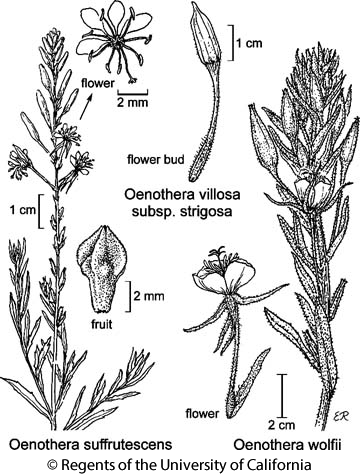 Jepson eFlora, Revision 5, http://ucjeps.berkeley.edu/eflora/eflora_display.php?tid=89231, accessed on April 25, 2019.
s DMoj (DMtns and surrounding lowlands) (naturalized Teh, SW); Markers link to CCH specimen records. Yellow markers indicate records that may provide evidence for eFlora range revision or may have georeferencing or identification issues. Purple markers indicate specimens collected from a garden, greenhouse, or other non-wild location.